Pentagon's War on Terror: Smokescreen for Ambitious Geopolitical Projects? The US' "war on terror" is a covert geopolitical project carried out under a fake counter-terrorism agenda, Canadian author Professor Michel Chossudovsky believes. According to the renowned Canadian economist and author Michel Chossudovsky, Washington's widely-discussed "war on terror" is nothing less than a series of military and covert intelligence operations being undertaken simultaneously on different geographic locations. "Major military and covert intelligence operations are being undertaken simultaneously in the Middle East, Eastern Europe, sub-Saharan Africa, Central Asia and the Far East. The US military agenda combines both major theater operations as well as covert actions geared towards destabilizing sovereign states," Professor Chossudovsky writes in his article for Global Research. 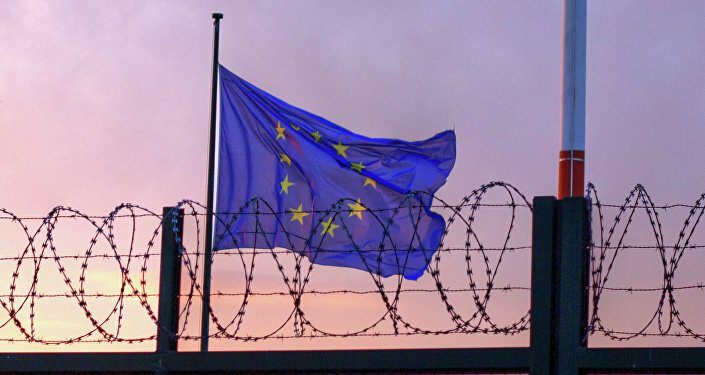 Paris Attacks: Beginning of the End of 'Europe Without Borders'? The Canadian author elaborates that the operations are carried out by the Western military alliance, while all the actions are coordinated "at the highest level of the military hierarchy." To illustrate his views, the Canadian author calls attention to the fact that the US-backed military actions in Ukraine coincided with the "onslaught of the attack" on Gaza, Syria and Iraq. As a result of this "economic conquest", powerful foreign investors are taking over "national economies" worldwide. "The Global War on Terrorism has become a consensus. It is part of war propaganda. It is also used by Western governments to justify and implement 'anti-terrorist' legislation. It is the cornerstone of the West's demonization campaign directed against Muslims. It should also be understood that the 'Global War on Terrorism' supports a process of 'economic conquest,' whereby countries forego their sovereignty," the professor explains, adding that the campaign against the Islamic State is in fact a smokescreen used by Washington and its NATO allies to maintain control over the Middle East and North Africa. Washington's anti-ISIL air campaign has evidently proved ineffective. Obama's critics have repeatedly slammed the US president for his inconsistent strategy in the Middle East. The answer is obvious, Chossudovsky notes: "from the very outset, this air campaign has NOT been directed against ISIS [ISIL]." "The air raids are intended to destroy the economic infrastructure of Iraq and Syria," the professor writes. According to the Canadian academic, the ISIL caliphate project could be a part of Washington's longstanding foreign policy plan to split Iraq and Syria into a Sunni Islamist caliphate, an Arab Shiite Republic and a Republic of Kurdistan. "The ISIS brigades were involved in the US-NATO supported insurgency in Syria directed against the government of Bashar al-Assad. NATO and the Turkish High Command were responsible for the recruitment of ISIL and al-Nusra mercenaries from the outset of the Syrian insurgency in March 2011," Professor Chossudovsky suggests. Syrian Knot: Is US Gov't Planning to Drive a Wedge Between Russia and Iran?